Children participating at the fourth Summer Reading Program organized by the Abuja American Corner and the U.S. Embassy got a special treat. This was when Association of Nigerian Authors (ANA)/Funtime Prize winner for Children’s Literature, Spencer Okoroafor, engaged them in a storytelling session. 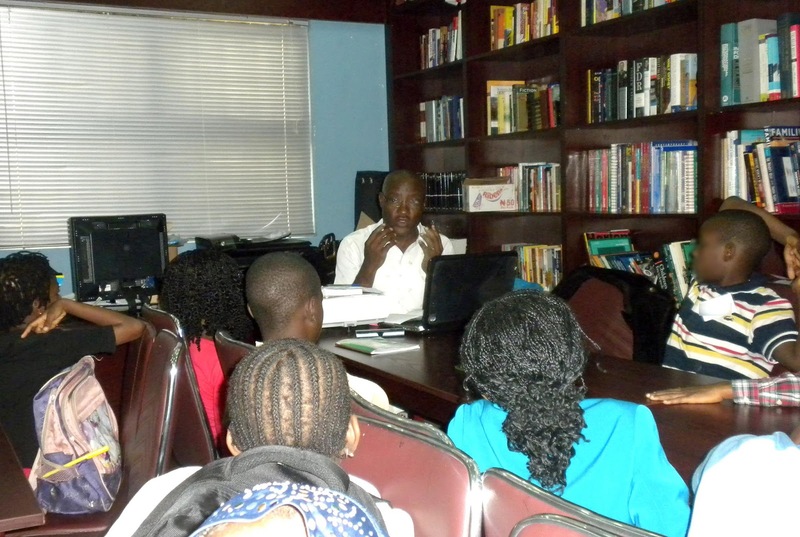 The summer reading program is an annual program aimed at encouraging reading culture amongst Nigerian children. Several different activities including: a spelling bee, poetry and arts and craft, have been infused into this year's reading program themed "Dig into Reading". Spencer began his session by informing the children that “there are many stories waiting to be told”. The first step to writing a story he said is identifying a problem “a good story identifies the problem; it is in trying to solve the problem that you tell the story”. He used the concept of preparing jollof Rice to explain how the plot plays out; “you add ingredients like salt, pepper, dried fish to make the rice taste good”. The plot, like cooking jollof rice, includes the various things that will happen in the course of the story to make it come alive. The children also learned that to make the story more believable to the readers, writers have to consider the setting and time the story takes place so they don’t say things that are not relevant to the time. Spencer informed the children that a story could be fiction or nonfiction “but in truth there isn’t any fiction; writers use their creative license to imagine and tell their experiences”. He also emphasized the importance of imagination in writing a good story. The children learned about the characters and first and third person narration techniques in storytelling and the importance of varying the use of these techniques. The children got a special treat when Spencer shared the product of his own imagination “Jide meets a ghost”; this story earned him the ANA/Funtime award for children’s literature in 2010. His book which he dedicated to “all those struggling to find answers to life’s questions” was based on an experience he had in the village years ago. The children listened with rapt attention as the author narrated how the protagonist set out to solve the problem of whether or not ghosts are real. At the end of his story the children had the opportunity to criticize the author’s work. Ten year old Wisdom shared his disagreement over the resolution of the problem in the story, “I don’t think that Jide’s problem was solved, he still didn’t know who the ghost was”. The author used the opportunity that the children’s questions presented to inform the children that the interpretation of any story will vary from one person to another. He also encouraged the children who were not satisfied with the ending of his story to write their own ending to his story.